Metal awl with pointed ends. The center is offset to prevent breakage, a trait that was typical of awls of English manufacture. Awls were fitted into a wooden, bone or antler handle by the user. Read more about sewing or preparing hides - enter 'sewing' or 'hides' in the search box to your left. Check the Beaver Index - e.g., Lucy of Povungnetuk, by Malvina Bolus, Summer 1959. Prior to European contact, indigenous peoples made their awls from bone, antler, and in some areas, local copper. They were used to puncture holes in hide, wood and birchbark. 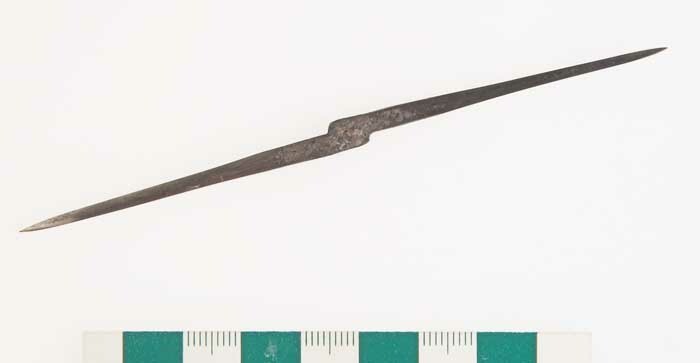 Generally made by blacksmiths working at the trading posts, metal awls were a popular trade good and the posts were always well-supplied with this article. In 1748, twelve awls were traded for one Made Beaver or a prime male adult beaver pelt, at Moose Factory. Along with other items, awls were sometimes presented as gifts to the wives of Aboriginal traders who used them for sewing clothing, coverings for their lodges and the seams of birch bark containers and canoes.